In light of Paul Pierce’s recent comments about his longstanding rivalry with LeBron James, the timing seems right to take a look back (with a Boston bias) at the top five moments of the Pierce-LeBron rivalry over the past decade. The pair face off for the first time this season Friday night, as the Wizards host the Cavaliers in Washington DC. Pierce may be with a new team now in Washington, but his most memorable moments against LeBron all came as a member of the Celtics. Let’s enjoy a fun trip down memory lane. In what likely served as the highlight of Boston’s 2012 Cinderella run to the Eastern Conference Finals, Pierce gave Celtics fans a glimmer of hope that a third NBA Finals trip may be possible with his late-game performance in Game 5. The small forward struggled against LeBron’s defense all game long, missing 13 of his first 18 shots of the night, but Boston fought back from a six-point fourth quarter deficit to take the lead in the game’s closing minutes. From there, Pierce hit one of the most iconic shots in Celtics history. 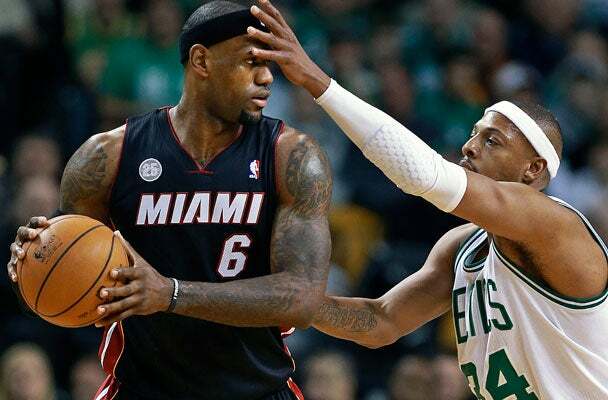 No clip better illustrates Pierce’s old school nature towards LeBron than this calculated decision. Here’s the setup: Doc Rivers subbed out Pierce in the final minute of a regular season contest in March 2009 and the Garden faithful was giving the captain a well deserved ovation after taking down LeBron’s Cavs. Pierce responded with a few high fives for those sitting at courtside — except for one kid. This one is a forgotten classic from the 2010 Eastern Conference Finals. LeBron was in his final days as a Cavalier, and his mother felt the need to protect the All-Star after a hard open court foul from Pierce. The most surprising and refreshing part about this play after watching it a few years later? Pierce wasn’t whistled for a flagrant foul. No need to rehash this one too much. LeBron’s play does all of the talking. To this day, given the performance and high stakes, the scoring effort put on by LeBron and Pierce remains as one of the most memorable showdowns in postseason history.